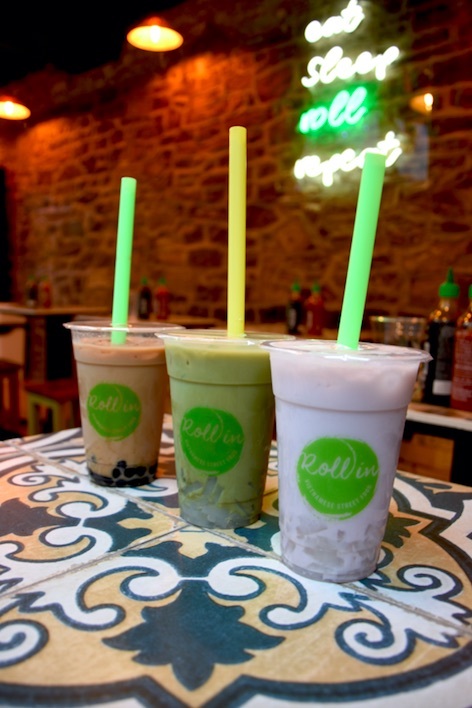 The brand-new Rollin Vietnamese is situated in The Arcade, in Bristol’s shopping district of Broadmead. 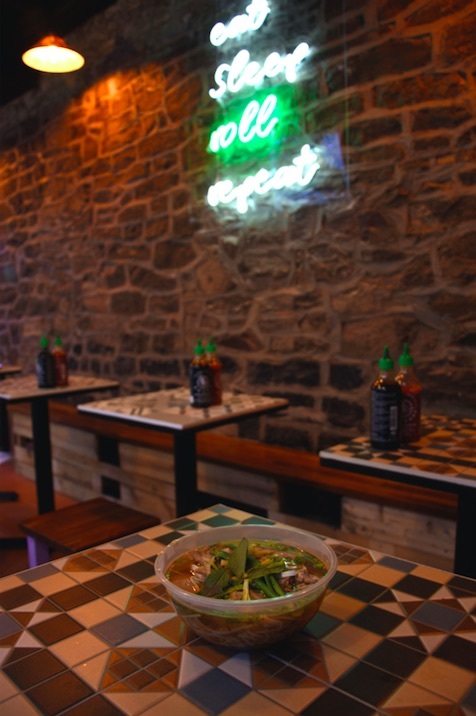 It is set inside a brick walled space, lit by Asian-style lamps hanging over little tables with each one accompanied by traditional sriracha and hoisin sauces. The neon signs on the walls create a welcoming modern atmosphere. They have a range of food that you will find along the bustling streets of Vietnam from noodle soups, banh mi (Vietanmese baguettes), salad rolls, pho, rice dishes and more! All can be enjoyed with a cup of Vietnamese drip coffee or bubble tea. They also source all fresh ingredients from local farmers' markets and suppliers in Bristol. The 100% Robusta coffee is directly sourced from a single artisan roaster in Vietnam, it’s safe to say that at Rollin’, they are all about good quality, authentic tastes. Three of us went in on a Friday lunchtime and felt immediately welcomed by the staff, who were very friendly, carrying big smiles. They recommended us the spicy noodle soup with beef (£7.50), which two of us chose. It was made with beansprouts, coriander, fresh herbs, stock and chillies. I chose rice with BBQ chicken served with cucumber, spring onion and chili. (£7.50). Some of the dishes work on a self-service basis. The noodle soups, summer roles, salads and baguettes are presented to choose in a fridge for you to take to the counter to be heated up immediately, if the dish requires. They then add the hot stock if needed. Rice dishes will be prepared in the kitchen and take a moment longer. The soup dishes came hot, and smelling delicious. A good choice for a cold winters day, the chili was warming and welcome in our belly’s. My rice dish with the barbeque chicken was topped with a little bit of chilli and spring onions. Which tasted moreish, sticky and sweet. We were already beginning to get full up and then they brought us some of their famous summer rolls to taste. Filled with vermicelli noodles, carrots, beansprout, herbs and either prawn, chicken or tofu (each £3.95 for two rolls), accompanied by a homemade plum sauce for dipping. The fillings were fresh and light, and combined with the rich dipping sauce, they made for a truly delighful taste sensation. The staff were extremely attentive to their customers. Often, they would wonder round and check up on everybody to see how their food was. To our surprise, one of the lovely ladies came out with three bubble teas for us to try. These they offer in different combinations. We had black tea in Classic, Matcha and Taro Variation (£3.50 each). The black and matcha tea drinks were not overly sweet, however the taro flavour was and we could not get enough of it! The drink had us practically drooling at the mouth...highley reccomended for those with a sweet tooth. What was clear to see whilst we were at Rollin Vietnamese, is that they match perfect food with perfect service. Offering authentic Vietnamese food, for a very decent price - be sure to check out this little gem of a restaurant next time you’re out for a shop!